In Italian cooking, anchovies are often used as a way to bring out the subtle umami (savory taste) in many dishes — in the same way Asian recipes use fish sauce or oyster sauce. For certain recipes, leaving out that umami note leaves the dish flat and mundane. For many people the best example of this is when they try to duplicate their favorite Asian take-out at home and it just doesn’t taste the same — the problem is you left out that weird little ingredient that produces the distinctive umami that you love. So, why am I talking so much about anchovies and umami? Because the recipe I’m featuring, Pasta alla Puttanesca, encompasses both. Doing some online research into the origin of Pasta alla Puttanesca; I found there to be many possibilities and contradictions. There are claims that the dish originated in Rome, Naples, or the Amalfi Coast. The name puttanesca has several “back stories” as to its origin. Most often it is noted that puttanesca is derived from the Italian word puttana meaning prostitute — with the story that since the ingredients are things found in any Italian pantry, it was an easy dish to “throw together” between clients… or that the aroma of the sauce cooking drew in potential “business.” Therefore, some claim that the name is more related to the pungent aromas and flavors of the dish made with garlic, anchovies, olives, and capers — which may be a nod toward the scent of the seamier side of life — with one account during World War II saying that these “camp followers” cooked the dish over barrels of burning garbage to entice the Allied servicemen in trade for nylons, cigarettes and alcohol. Which then leads us to the idea that in Italian “puttanata” is an all purpose profanity which may denote “refuse” or “garbage” (as we might use “crap“) as if to say, “I just threw a bunch of ‘crap’ in the pot and out came this amazing sauce.” This might also speak of the idea of the burning garbage cans — but more likely it denotes the middle-class, humble origins of the dish. Whatever the origin, it is said to be a popular late night snack in Italy, and eating Pasta alla Puttanesca is a wonderful culinary experience… but it’s definitely not for the faint of heart, or the bland of palate. That being said, when you look at recipes for puttanesca sauce you often see smaller amounts of garlic, red pepper flakes, capers and anchovies which to me seems counter intuitive since the dish is known to be spicy, salty, and deeply flavorful. Keep in mind that this sauce is meant to coat the pasta, not drown it, so the strong flavors accent the neutral taste of the pasta. Many times you will see puttanesca sauce served with spaghetti, but here I’m suggesting penne which I think goes nicely as the ridges and short angled tubes allow the sauce to cling. 2. Meanwhile, add the olive oil to a medium sauce pan over medium heat, add the onion and cook, stirring occasionally, until soft about 10 minutes. 3. Add the garlic, red pepper, and anchovies to onions and cook, stirring, until the anchovies disintegrate and the garlic has softened, 2 to 3 minutes. 4. Add the tomatoes, wine, capers, and olives. Cover the pot, adjust the heat so the sauce simmers gently, and cook, stirring occasionally, until it’s thick and saucy, 25 to 30 minutes. Stir in the chopped parsley, taste and season with salt and pepper as needed. 5. When the water comes to a boil, add 1 TBSP salt and pasta. Cook according to package instructions until al dente, about 8 to 10 minutes. Reserve about 1 cup of the pasta cooking liquid and then drain the pasta and return to pot. 6. Pour the sauce over the hot pasta, toss to coat, adding the reserved cooking liquid as needed to thin out the sauce. Serve steaming hot with a generous sprinkling of Pecorino Romano cheese if desired. There you have it, Pasta alla Puttanesca — not for the faint of heart, but molto dilizioso! And no matter what the name may imply… the bold, exciting flavors and appetizing aroma of this dish make for a memorable, but “PG rated” dining experience. And if you haven’t been an anchovy lover in the past, I hope you try making puttanesca and taste the wonderful umami these little fishes can bring to your Italian cooking. Tomorrow is Thanksgiving Day and on my table there will be a butternut squash casserole that has been part of our annual feast for nearly 30 years. This casserole came to my attention, believe it or not, at our wedding reception. Andrea and I were married in October 1987 and had our reception at the now gone, but fondly remembered, Wishing Well Party House in Rochester, NY. When planning the menu for the reception, the Wishing Well manager spoke of their “famous squash casserole” and I was a bit skeptical… I like squash, I thought, but was it really something I wanted on my wedding reception buffet? Still we were assured that it was always featured on their buffet menus and it was a favorite among the Wishing Well guests. So, okay, we’ll have the squash. As you can guess, the dish was amazing and Andrea and I loved it (and so did most of our 200 guests). The following year I recreated that “wedding squash” recipe for Thanksgiving dinner, and it has been a centerpiece of our traditional Holiday meal ever since. Now when I was growing up my Mom made squash for the Holidays but it was a simple preparation of mashed winter squash (usually from those little frozen boxes) with some salt, pepper, and butter. It was a vegetable after all and nothing fancy. Quite honestly, it wasn’t my favorite. Back in those days the extravagant Holiday side dish was always the candied yams (which, by the way, came out of a can) topped with butter, brown sugar and mini marshmallows — or doused with maple flavored pancake syrup (Staley’s brand) — and baked to a bubbling, sticky-sweet decadence. Dan’s Thanksgiving Squash on the other hand has a nice balanced flavor profile of the subtly spicy, savory butternut squash and the sweet, crunchy pecan streusel topping. Dan’s Thanksgiving Squash is made with butternut squash since it yields a good quantity of usable flesh after it’s been peeled and seeded — but you can successfully use any variety of orange flesh winter squash (i.e. hubbard, acorn, buttercup, red kabocha). Hint: Since winter squash can be difficult to peel and dice, I look for the fresh “cleaned and cut” butternut at my local Wegmans supermarket. But if you can’t find fresh pre-cut squash and want a short cut you can definitely use those little boxes of frozen squash instead. 2. Place diced squash in a large saucepan with about 2 inches of water, bring to a boil, reduce heat to medium, cover and allow to cook until very tender (about 15-20 minutes). Drain and mash with a potato masher until smooth. 3. Add melted butter, pumpkin spice, vanilla, and salt to squash and stir to combine. Pour squash mixture into a 3-4 quart casserole or 9×13 pan that has been sprayed with cooking spray. Set aside. 4. Prepare topping, by combining flour, cinnamon, salt, brown sugar, and chopped pecans in a mixing bowl. Cut in butter pieces until combined and crumbly. 5. Spread the pecan topping evenly over the squash mixture in the casserole dish. 6. Bake in preheated oven for 30-40 minutes until golden brown. Remove from oven and serve. There you have it, Dan’s Thanksgiving Squash. I hope your family enjoys this dish as much as mine does (my father-in-law calls in advance to make sure I’m making it). This side dish is sweet, savory, and just plain yummy! It’s a great addition to your Holiday dinners. Perfect next to the turkey and stuffing. But if it doesn’t make it on your Thanksgiving table this year, then try it the next time you make roasted chicken, ham or pork… and I hope you and your family have a wonderful Thanksgiving! I recently had the opportunity to attend a tasting event that was catered by some Rochester area eateries. One of the menu items was a decadent hand-rolled gnocchi in a three cheese cream sauce that was out-of-this-world delicious. Well worth the extra calories… I had three servings! Enjoying that dish reminded me of the Potato Gnocchi we served at Lista’s. As I mentioned in an earlier post (6/18/17) my family often ate dinner at the restaurant on Friday nights, and most the time we ate a meatless meal, and my personal favorite choice was the gnocchi. Gnocchi (pronounced NYAW-kee or NYO-kee) is the plural form of gnocco literally meaning “lump” in Italian. The word is most likely derived from nocchio (meaning a knot, as in wood) or nocca (meaning knuckle) — obviously a descriptor of the gnocchi’s appearance. Gnocchi is a type of dumpling typically made with semolina or wheat flour and egg, with other ingredients that may include cheese, potato, and sometimes breadcrumbs or cornmeal. Dumplings are found in many cultures and in many forms — gnocchi, being an “unfilled” dumpling, is probably more akin to kluski (Polish “lazy noodles”) or Knödel (German potato/bread dumpling) than say, ravioli, pierogi, or jiaozi (Chinese “pot stickers”). 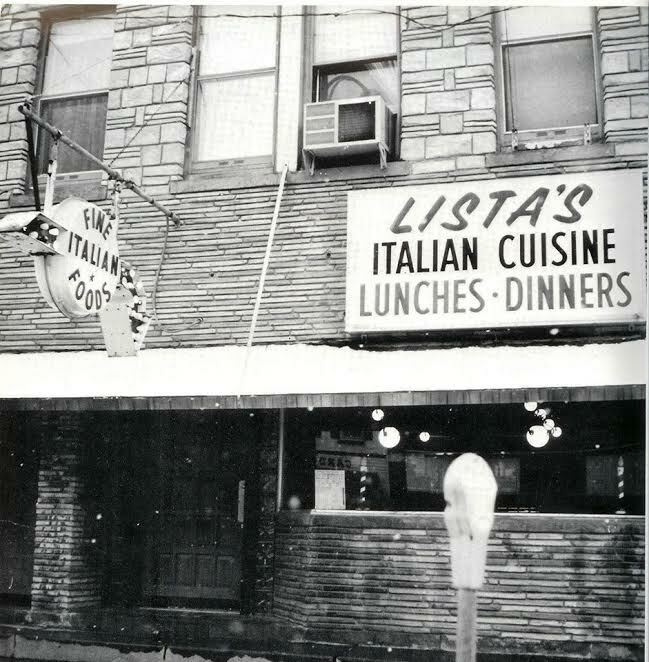 At Lista’s, gnocchi was one of those menu items that only the true Italian food lover would order. In the course of a busy night at Lista’s, for every 100 potions of spaghetti or rigatoni served — we might only serve 1-2 portion of gnocchi. Still, for those of us who love these little “lumps” of soft dough, the Lista’s preparation was delicioso! Still, I must admit that combining the gnocchi with the famous Lista’s Sauce and then folding in smooth, creamy mozzarella along with sharp Pecorino Romano may have been what I really liked… but to this day even if they are dressed in basic aglio olio or even a simple brown butter… I love, love, love gnocchi! 1. Place the unpeeled potatoes in a large pot and cover with cold, salted water. Bring to a boil, reduce heat and simmer until potatoes are just fork tender but not over cooked (about 15 minutes). Remove cooked potatoes with a slotted spoon and cool slightly. 2. Peel the potatoes, and then press them through a potato ricer; grate them with the large holes of a box grater, or simply mash with a fork in a large bowl — let cool. Add the lightly beaten egg and the salt to the potatoes and mix well with a wooden spoon. 3. Add the flour to the potatoes a little at a time, using only as much as you need so that the dough comes together; is not sticky, and all the ingredients are evenly incorporated. 4. Dump the dough onto a clean, lightly floured surface. Knead the dough as you would bread dough for about three or four minutes. 6. Place the gnocchi in a single layer on a lightly floured or parchment-lined tray until ready to cook. (If you want to freeze them for later use, leave them on the tray and pop them in the freezer. Once they’re frozen put them in a freezer bag and store frozen for up to 3 months. 7. To cook the gnocchi, bring a large pot of heavily salted water to a boil, place about a third of the gnocchi into the pot and give a gentle stir to keep them from sticking together. After a few minutes the gnocchi will float to the top. Continue to cook for one more minute then remove with a slotted spoon and set aside. Cook the other two batches in the same way. 8. While you are boiling the gnocchi, heat the prepared sauce in a large skillet over medium heat. When heated through, add the diced mozzarella and cooked gnocchi and gently fold them together until mozzarella is melted. Just before serving, add the Pecorino Romano and fold it into the gnocchi and mozzarella. Serve immediately topped with more Pecorino Romano if desired. Yum! There you have it, Potato Gnocchi just like we served at Lista’s. Making homemade gnocchi isn’t difficult, but it can take time and patience to perfect the technique. With a little practice you’ll be producing light, fluffy dumplings that people will rave about. Gnocchi are terrific as a main course, but also work well as an appetizer or side dish. I wrote this recipe with tomato sauce because that’s the way we served them at Lista’s and the way I remember enjoying them growing up. But for variety try mixing the cooked gnocchi with some basil pesto or sage butter… or as I mentioned above pan saute them with some garlic and olive oil (aglio olio) until slightly browned and top with some grated cheese and fresh chopped basil. Delicioso! I hope you give Potato Gnocchi a try and hope you love them as much as I do. First, I want to thank you for following me on 74 Main Street. Life has been very busy the past 2 weeks and I wasn’t able to sit down and write a post. I’ve missed writing and hope you’ve missed my recipes. Unlike many Italian American families, my family did not gather together on Sunday for a big pot of sauce and pasta. Actually my Dad preferred a good roast for a family dinner. Still, my Grandma or my Great Aunt would occasionally make sauce and they would definitely cook it all day with sausage, meatballs, and pork to add flavor. But my personal favorite was when they put chicken in the sauce. For me chicken cooked in tomato sauce until it’s falling off the bone is a beautiful thing! So, one very popular Italian chicken dish has long been a personal favorite… Chicken Cacciatore. That being said, Chicken Cacciatore is derived from the Italian preparation “alla cacciatora” or hunter style — or more literally “prepared in the style of the hunter’s wife.” In Italy, this dish was traditionally prepared with rabbit (congilio alla cacciatora), pheasant, or other game. But today it is more commonly made with chicken. Chicken alla Cacciatora is a dish that appears to have no true identity. There are hundreds of versions throughout Italy and no two seem to be exactly alike. And there are no real common threads among the recipes aside from the name and the main ingredient being chicken. Many regional recipes for cacciatora do not contain any tomato products at all, but generally consist of meat braised with wine (often red wine in the south and white wine in the north), garlic, onions, and herbs. Some recipes contain sweet or hot peppers… and many recipes include mushrooms, as this is commonly considered an ingredient in “hunter style” preparations — I guess hunters somehow find time to gather mushrooms while stalking their prey. In most Italian American versions of Chicken Cacciatore it is common to find tomato sauce, red or green bell peppers, and mushrooms in the recipe. The recipe I’m featuring here is an old school recipe that comes close to the southern Italian roots of the Lista family. I really like this version of Chicken Cacciatore because it doesn’t contain mushrooms (which my wife can’t eat) and it does contain olives which we both love. Although the original recipe calls for a whole chicken cut up — I have chosen to use only bone-in, skin-on chicken thighs. First, because it’s economical and second, because the dark thigh meat brings a richness to the dish. You certainly can use whatever cut of chicken you prefer, but since this is a braised dish, I would suggest staying away from boneless, skinless breasts since they tend to become dry when cooked for a long time. 1. Season chicken on all sides with salt and pepper. 2. Heat the olive oil in a large, heavy skillet or dutch oven with lid over med-high heat. Add the garlic, red pepper flakes, rosemary and chicken pieces. Cook, turning chicken occasionally, for about 20 minutes until chicken has browned on all sides. 3. Pour off some of the accumulated fat (leaving just a coating on the bottom of pan) and add the sliced red and green peppers. Cook turning occasionally until peppers begin to soften. Add the red wine and allow to simmer until liquid reduces by half. About 10 minutes. 4. Pour the canned tomatoes in a small bowl, squeeze them with your hand until they are broken up and add them, along with the olives, to the chicken. Cover and simmer for 30 minutes until chicken is thoroughly cooked. If sauce becomes too dry add some chicken broth or water. 5. Remove from heat and allow to rest for 10 minutes, adjust seasoning with salt and pepper, and serve spooning the sauce over the chicken and sprinkling with some Pecorino Romano if desired. There you have it, old school Chicken Cacciatore. This goes great with a heartier long pasta like linguine, or try it over some creamy polenta, or even alongside some fresh mashed potatoes. The richness of the chicken thighs works so well with the briny olives and the acid from the wine and tomatoes. I hope you give this recipe a try… and I won’t mind if you throw in some sliced mushrooms in honor of those Italian hunters.